Besides bringing the best of contemporary poetry and music to the Milwaukee arts scene, Woodland Pattern also hosts the Experimental Film and Video Series. The series presents 10-12 screenings of experimental film per year on the last Friday of the month. Carl Bogner, a 43-year-old instructor at the University of Wisconsin-Milwaukee, has curated the series for the past five years. Bogner has also programmed the Milwaukee Gay and Lesbian Film Festival for the past eight years. Experimental film, according to Bogner, is “a wonderfully large term that includes a lot of approaches, which could include narrative, but probably for the most part includes non-narrative work.” Experimental film is work by a single maker who is exploring an idea, which might be thematic or formal, that is highly personal and is perhaps closer to poetry or music than to traditional film. The genre of experimental film has existed since the beginning of filmmaking, and Woodland Pattern’s series has featured both contemporary and canonical work that might not otherwise find a berth in Milwaukee. “It’s a way of championing…alternative forms…not unlike the way Woodland Pattern does with writing,” Bogner said. The series presents a mix of contemporary and historical, and international, national and local films. Programs have included the films of local filmmakers such as Diane Kitchen, Jennifer Montgomery and Stephanie Barber. Bogner stays current with contemporary film by reading film festival schedules from other cities and by soliciting new work by artists, as well as by attending film festivals. His role as programmer and instructor for the two-semester introductory film class at UWM demands that he program 14 weeks of screening per semester for his students, and that he present a varied and different set of films each semester. “I never have the same syllabus. I always want to show different work,” Bogner said. Bogner has a special affection for films made in the years between 1960 and 1974, which he sees as an especially interesting and inventive period in which there was a lot of questioning having to do with forms and challenging of those forms. In that era, “people were investigating what the frame can contain or breaking down the image to see what it contains,” Bogner said. The contemporary scene is “so rich and diverse and there is still this cross-generational dialogue [with the 60’s] going on.” Woodland Pattern’s film offerings have sometimes been tied to one of its featured writers or to an event such as the Harley Festival on Locust Street or even to presidential politics. A particularly well attended event, in February of 2005, was a screening of The Bird People by Michael Gitlin. The Bird People “was this beautiful documentary about people who are devoted to the study and…observation of birds. [It was] a wonderfully made film,” Bogner said. Woodland Pattern was filled with people who were not experimental film buffs but avid bird watchers. “What I loved about having [the bird watchers] there and what helped make the screening as vital as it was, was that there [was] all this laughter of recognition. It was just a wonderful, warm, generous screening,” Bogner said. “I like the series because I feel its casualness can make it an inviting space, especially for work that might be foreign to a lot of people.” On Friday, Oct. 28, at 7 pm the Experimental Film and Video Series will present Winnipeg Babysitter, a history of independently produced television in Winnipeg, Manitoba, curated by Daniel Barrow. Upcoming Events Jacqueline Lalley workshop: Decompositions: Bringing Your Poems Back from the Dead. Sun.Oct. 9 and 16, 1-4 pm. Thomas A. Clark, Scottish poet: Reading at Woodland Pattern: Sun. Oct 9, 7 pm. The Gallery will be exhibiting his work in a show, “The Bright Glade.” He will be giving a talk at UWM Golda Meir Library, Oct. 10, 8 pm. 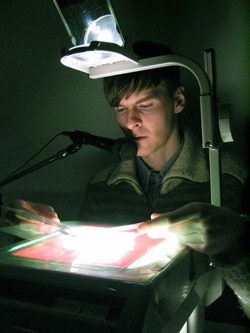 Leslie Fedorchuk workshop: “Text/Image/Memory” Thurs. Oct. 20, 6-8 pm. Bookmobile: Fri., Oct. 21 5-7 pm. The Bookmobile exhibits artist books, zines and independent publications. A workshop on album binding will be held at that time. Also on Oct. 21, at 7:00 pm, the Redletter Reading Series presents Linda Ramona Vitkauskas and Ander Monson. Vitkauskas, a widely-published poet from Illinois and fiction editor and web designer for Milk; Monson, born in Michigan’s Upper Peninsula, teaches at Grand Valley State University in Grand Rapids, Michigan, and is editor of DIAGRAM and The New Michigan Press. Alternating Currents Live: Assif Tsahar on reeds and Cooper-Moore on one-string bass, fretless banjo, mouth bow, drums and flute. Sun. Oct. 30, 7 pm. Contact Woodland Pattern at 263-5001.